Half Way through the Season! We want to thank you all so much for getting us halfway through this winter! We have already served well over 100 guests this season. We are in our busiest two months now. There is always a build up from December into January and we stay very full until mid-March. February is a short month, so let’s see if we can fill in all the days on the calendar! We still have a need for overnight volunteers in Milford. We have dinner slots and intake available at all the shelters. 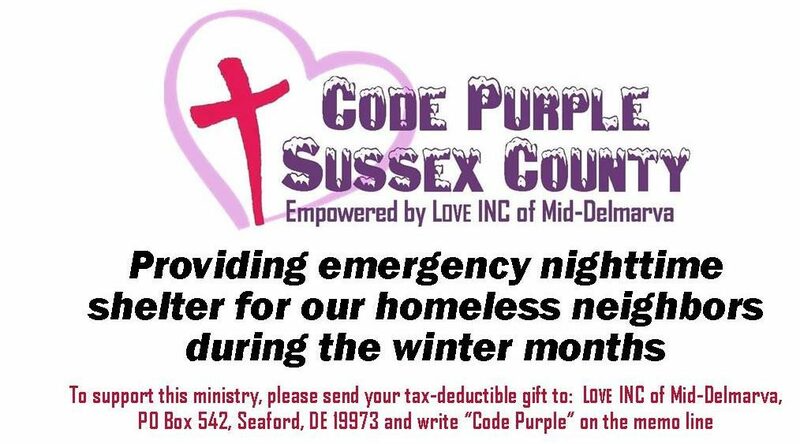 We are still in need of transportation from CROSS in Seaford to Gateway at night and then from Gateway to Seaford in the morning. Some of our volunteers haven’t been able to fit all the ladies in their car. In response to some confusion due to the posts sent out by other entities during this cold snap, we want to remind everyone that we have been open every night since December 15th and will be open every night until March 15th. We will operate according to temps March 16th-31st. During that time, we will be open when the temp is 32 or below (that is listed as ON CALL on the sign-up calendar). Again, we are very grateful to all the wonderful volunteers that have stepped up this year. You have helped us make it a successful season so far and we ask that you continue to support us by signing up and also by sharing our ministry with others.